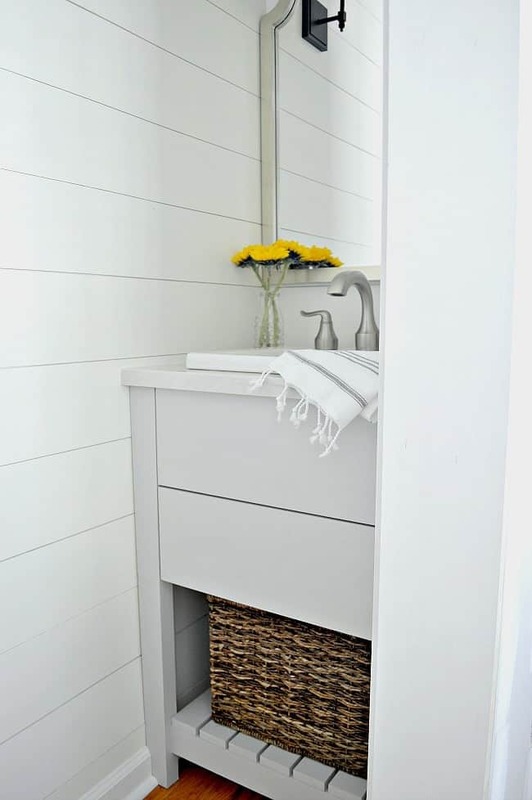 How to build a DIY farmhouse bathroom vanity to fit your space. We’re still knee deep in the new powder room project that we’ve been working on for the past several weeks. Last week I shared all about the construction, but today is all about our progress and a bit of pretty with a DIY bathroom vanity, new faucet, lighting and a mirror. You’d think that a tiny space would be easy to transform but you would be wrong. Nothing about this project has been easy. From the planning stages to where we are now it’s been one problem after another. Besides the obvious issue, trying to work in such a tight space, we had to deal with delivery delays and 2 broken sink deliveries. Not what you want to see when you’re ready to start building a vanity and you need a sink in order to do it. Let’s take a look back to where we started…a big closet with our seasonal clothes and a lot of shoe boxes. 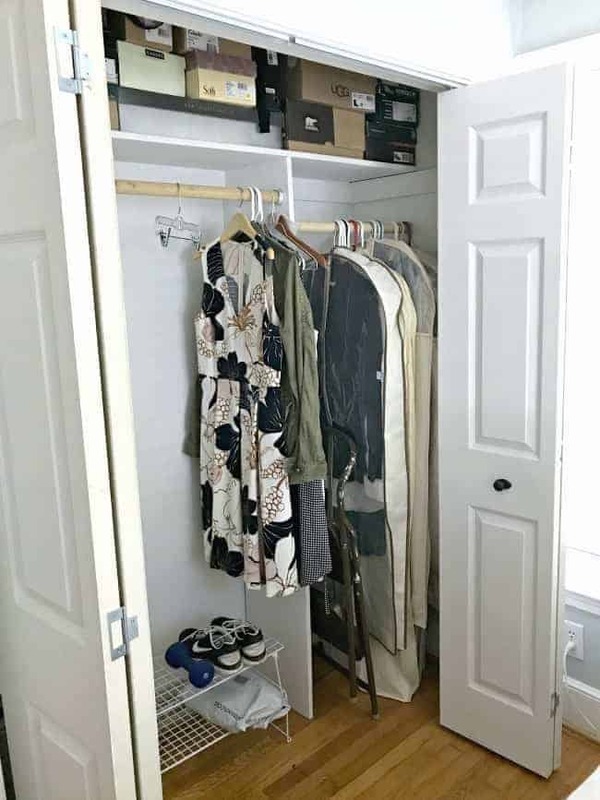 A previous owner built this closet a few years ago so it’s larger than your normal 1946 bedroom closet. 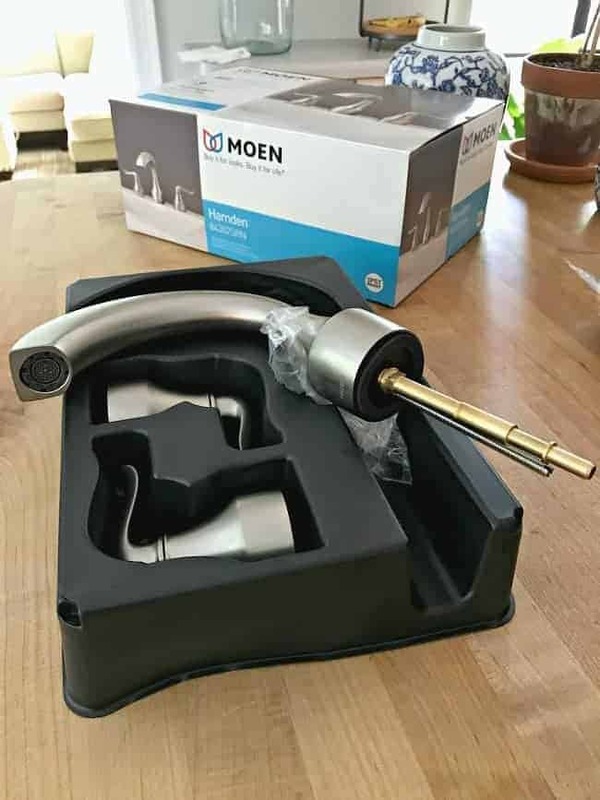 *This is a sponsored post written by me on behalf of Moen. All opinions are 100% my own. It definitely won’t be a big bathroom but it will be functional, and that’s all we need. One side of the space will have a toilet and the opposite side will have a vanity. With the walls planked and painted and the electrical done, it was time to start the vanity side of the space. 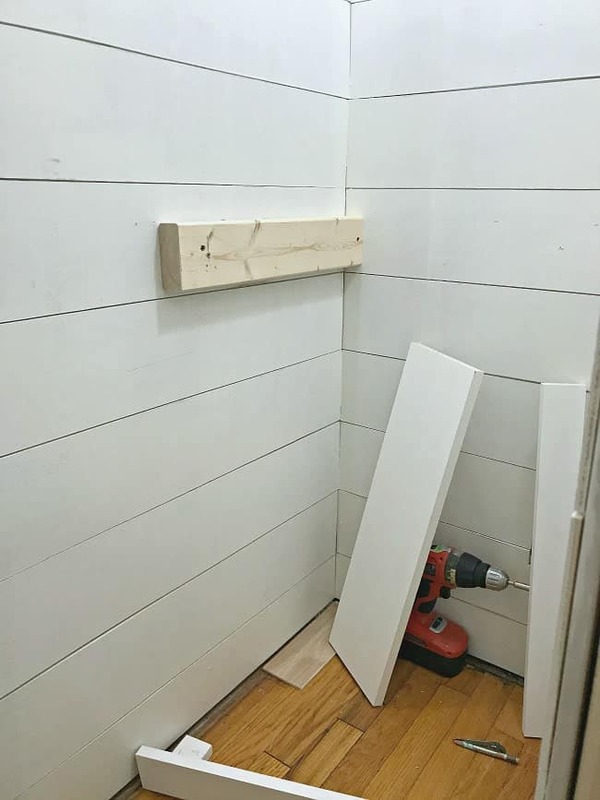 Like I said, this is a tiny space with walls that aren’t square, so we knew early on in the planning stages that we would have to build a vanity. 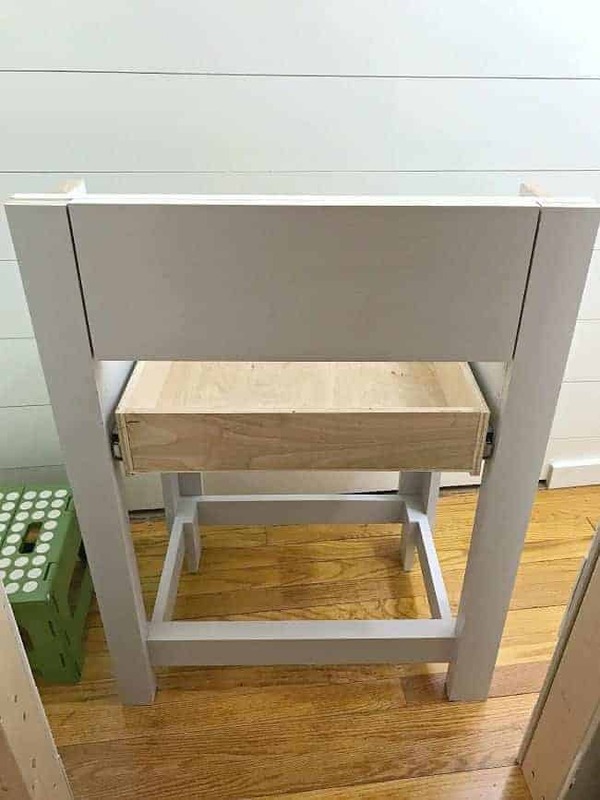 A simple piece with an open design and one drawer. It doesn’t look like much but it took quite a while to put together. 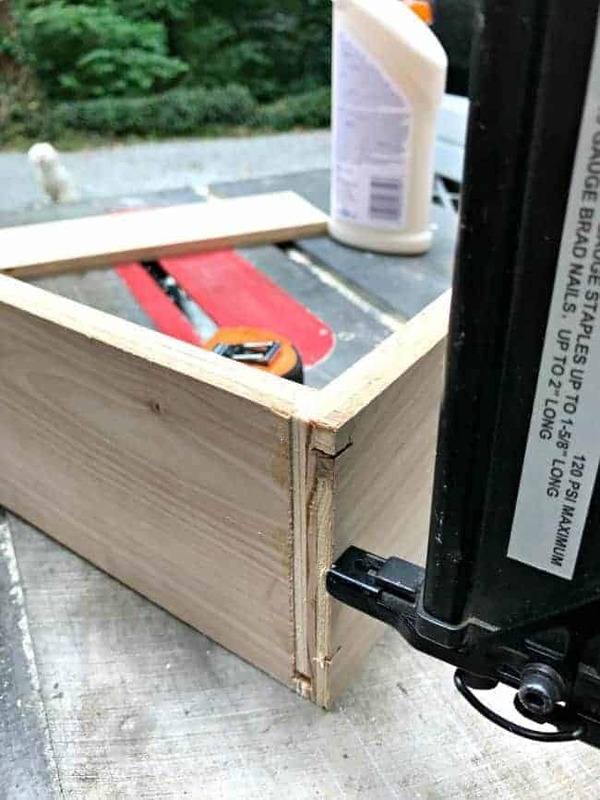 Every piece had to be custom cut to fit the space. The hubs also made sure to hide any screws or staples that he used so there was no patching. 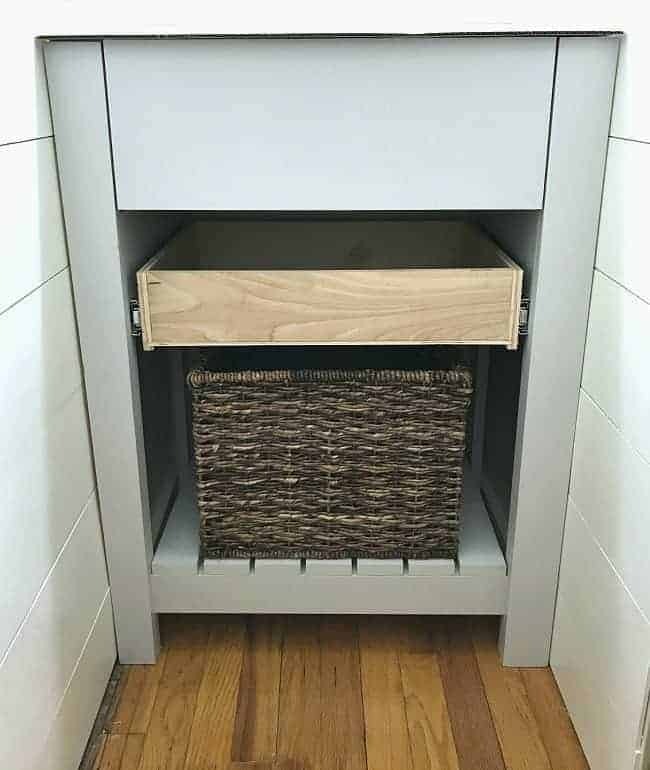 It won’t have a lot of storage but we were able to add a small drawer. With all the white going on, I decided to go with a light gray for the vanity. It adds a bit of contrast and will go with the veining in the countertop. We chose to go with a drop in sink so the drawer sits a little lower. 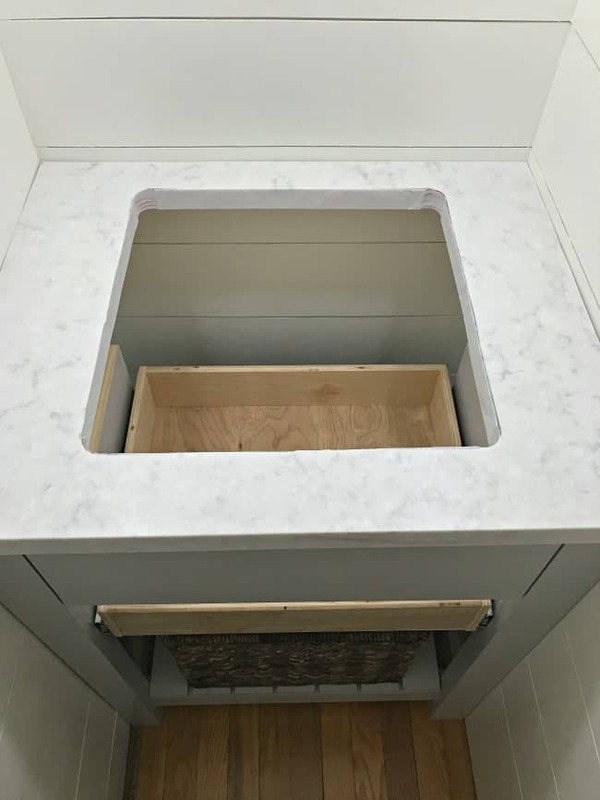 The sink bowl will be behind the panel that’s above the drawer, which is typical with vanity construction. The basket on the shelf serves several purposes. It will hold toilet paper, it adds some texture and warmth and hides the plumbing for the sink. We were so happy to see the vanity in place. After the countertop and sink are installed, we’ll put the front on the drawer and it will be complete. As luck would have it, we were able to score a nice piece of Silestone from a neighbor (for free!) 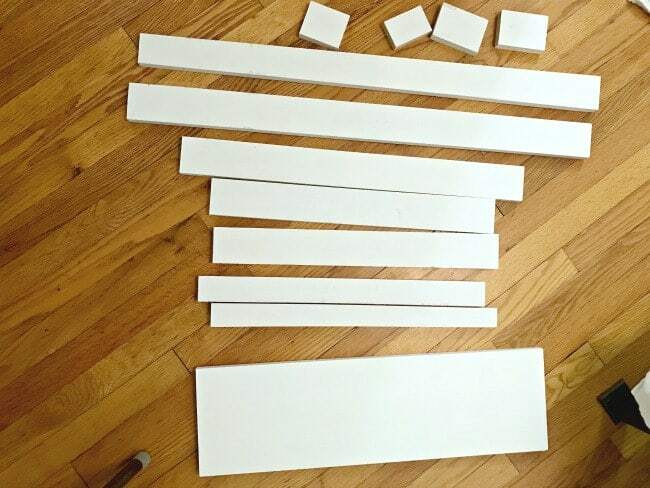 to make the countertop. We were a bit nervous about cutting it but it was really not that difficult. Messy for sure, but not difficult. Isn’t it pretty? 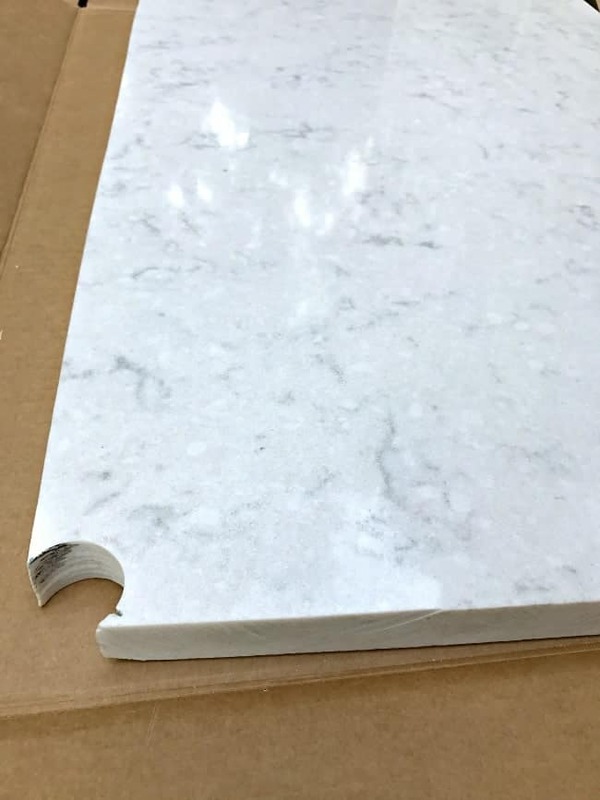 It looks just like marble. Once the countertop was on, we could add the sink and get it ready for plumbing. Before the plumbing though, we added the pretty pieces…lighting, a mirror and a new faucet. It took me three tries to get the perfect mirror. The first one was too small and the second was was good, but broken. The third time was the charm – and it’s the perfect piece. The lighting was a little tricky. We talked about hanging a fixture over the mirror but that wall had a beam running right where the fixture needed to go. Not impossible, but a lot more work. This solution worked out well. The only issue was that I had to find sconces with a shorter profile. I’m happy to say that my first choice was the winner, and they weren’t broken. Yay! The last, and easiest, installation was the new faucet. 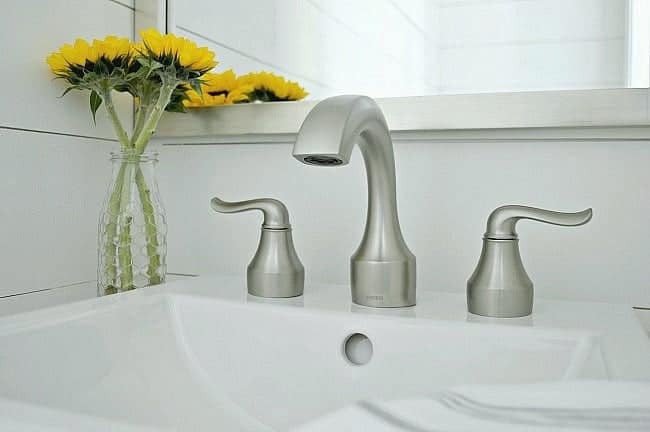 I love this simple and sleek new faucet from Moen. It’s the perfect touch for the new vanity. Love the curve of the handles! There’s still a lot of work to do before we can call the powder room done, but one side is almost complete. I can’t wait to finish this space. It will be a welcomed addition to our small cottage. We’ve started the guest bedroom closet if you want to check it out. That is a small space, but you’ve given it a wonderful farmhouse charm. Love how it’s turned out! Takes me back to the day we lived in a 1930’s house, and you definitely have to adjust to small closets and bathrooms. I love how you remodeled your bath! We weren’t sure if it would work out but, now that it’s useable, it’s fabulous. Small to be sure but an extra toilet is an extra toilet. 😉 I’m excited to finish up and reveal the completed space. Thanks so much for stopping by and taking a peek, Florence. Love what you’ve done in such a small space. Where did you find the mirror? This is so stylish. Every detail is so well thought out. Thanks so much. Because it’s such a small space, we really had to plan everything out so it would all fit. I think that it’s coming along though. We still have a few hurdles but nothing major (fingers crossed). Just found you again, for some reason your blog had been redirected to junk email. As usual, another fantastic project, can’t wait to see the completed room. Thanks so much Jacky! So glad you found me again. 🙂 If you have hotmail, I think you you can click the “not junk” button. Hopefully it will just go to your regular inbox next time. Awesome job my friend! 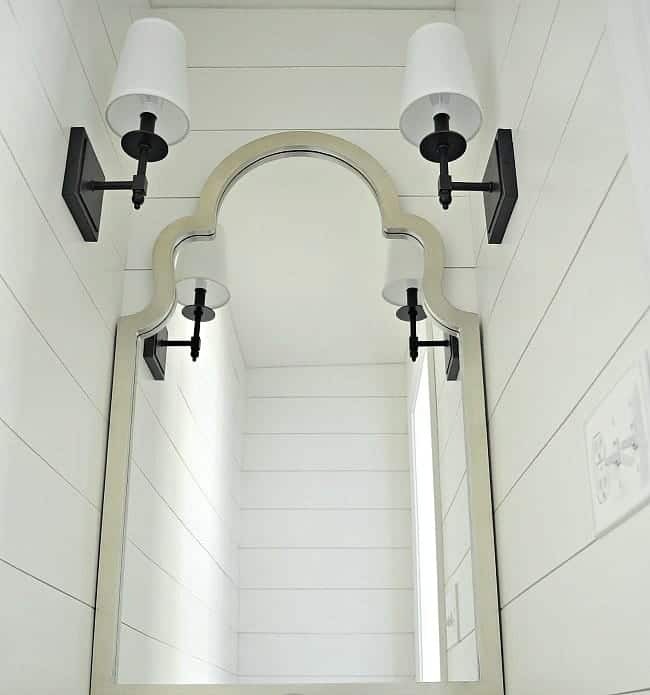 I love how the sconces look there on the side with their reflection on the mirror! You’re giving me lots of inspiration for my tiny power room! Thanks Betty! The vanity turned out better than I thought. 😉 The room is small at (roughly) 31″ wide by 72″ long. Hi Kristi, I have just found your blog. I can’t remember how. I have spent the day going through many of your posts because i sprained my foot and can’t do much. I read that you did that too! I love your blog. Your pictures are so clear and well done. I love your style as well. It is so crisp and clean. You have such a cute house and you are adding such wonderful projects and touches. I also love that your house is not 5000 square feet and all gray and white. I like that look, but I like color too. Your house feels very cozy and inviting. 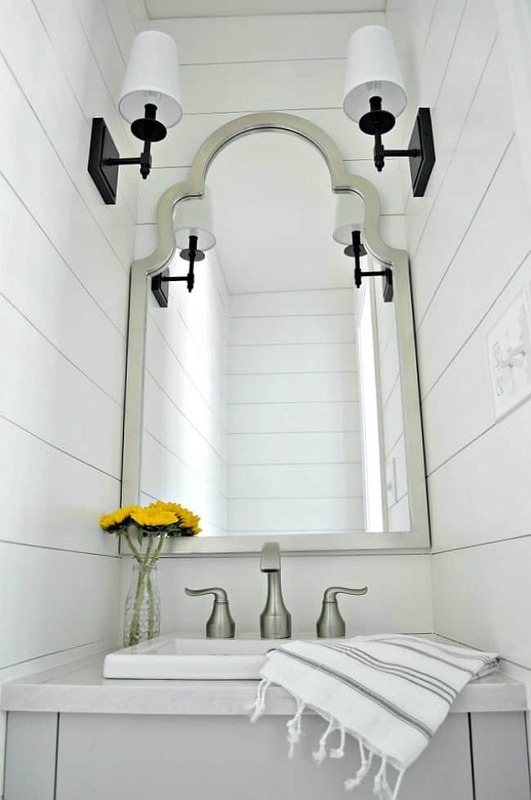 Can’t wait to see the powder room and all of your projects as they unfold. Keep up the good work! 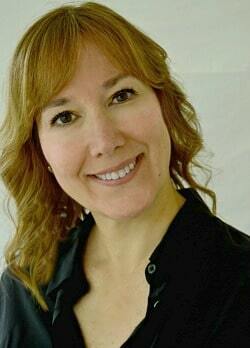 Hi Julie and welcome! I’m so glad that you found us and stopped in to look around. We have a lot going on right now with the powder room addition so I hope you’ll stop back to check it out. Wow, Kristi, that looks great. Y’all did a fabulous job in such a tight spot. Our master bath reno has begun and oh, what a mess and lots of work ahead. Thanks Kim! It’s definitely tight but will serve our needs. I saw your that your bathroom reno had begun. I’m sure it will be beautiful when it’s done. Looks wonderful, it will be a big surprise when people see it for the first time. They will be very impressed just like i am. Looks like you have been mighty busy with all the changes you are making to your charming stone cottage. Everything you do has such a special touch to it and I can’t wait to see what is next. Awww, thanks Marjorie! I appreciate your sweet comment. We have been very busy but we are having fun. Thanks for stopping in to check it out. Wow! That’s all I can say. I love the vanity! I love the mirror! I love the lights! It’s hard to believe this was a closet! I know, right? It looks so different from the closet it once was. Thanks so much Sherry!!! You Two!!! What a team! Outstanding job. I can’t get over how nicely the mirror fits. Love it all and can’t wait for the next segment. Goodness you guys have been busy! It all looks great and you are so creative with the space. Living in cottages, I totally get it. Nothing is easy when the spaces are small and the house is old, but you guys make it look like a breeze. What a great job! The vanity side looks great and I look forward to seeing the completed room. 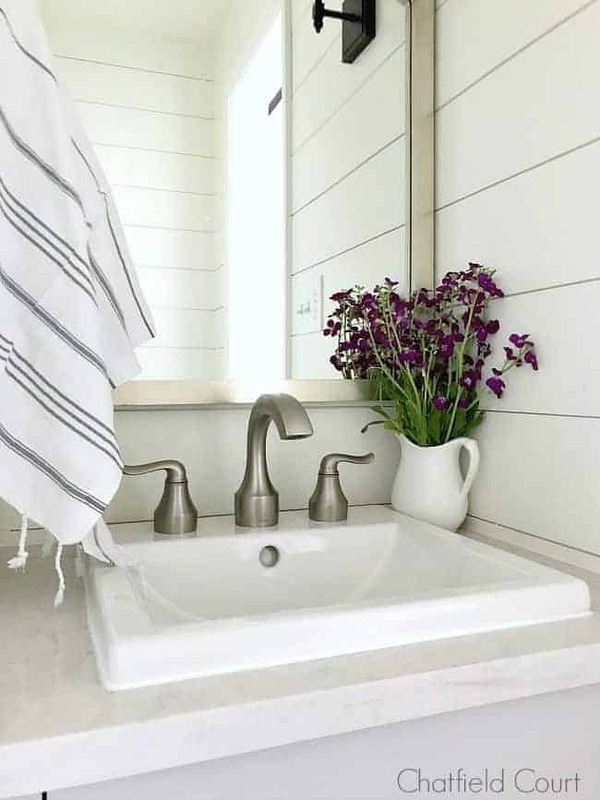 The vanity is simple but beautifully done. Your husband is one talented guy! What a lovely powder room. You are so talented. Who ever did my bathroom stopped the cabinet halfway to the wall. There is a window above that end so no mirror but I would have had the cabinet and counter top go all the way down for storage. As it is I am stuck looking for a cabinet the right height and width to fit there otherwise it looks unfinished. Maybe you and the hubs can come for a working vacation and help me build it out. LOL Have a great week. Thanks so much for your sweet comment Debbie! It’s amazing the amount of shoddy work people do in their homes. We’ve had a lot of houses and we’ve seen it in every one of them. It just stinks when you move in and have to fix it. Thanks for checking out our new space. It looks great! I can’t wait to see the photos when it’s finished! Thanks so much, Piper, I appreciate it! Unbelievable what can be done with such a small space. Can’t wait to see it finished. You and your husband have done a great job with your new home. I keep telling you how much I love it and I love it more every time you finish yet another project. Sometimes great things come in small packages. Awwww, thanks so much for your sweet comment Pat! We really didn’t think we would be able to fit one in and we’re thrilled that we can (even if it’s teeny tiny).